If you leave your garage in the morning, perhaps still bleary eyed, and see this at the entrance, you know that the day has perhaps not began so well, especially if you leave the garage over the prescribed speed limit. This is not a camera for you to smile and wave. 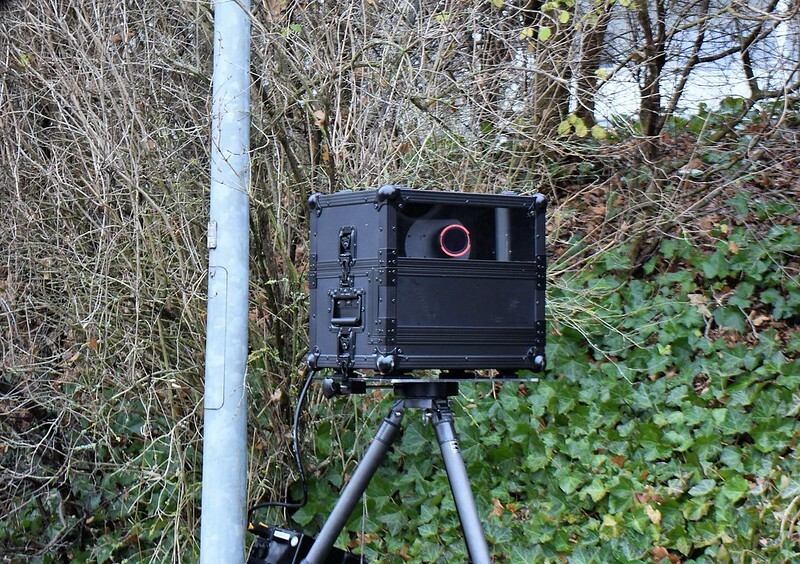 Some time in the early morning hours a car, truck or van arrived and this lookalike Hollywood film camera was placed in a strategic place to measure the speed of the passing cars by the local police. Sometimes a photo might also be taken. It is always advisable to have a smile on your face in the car and have a neat hair style. Your clothing should also be stylish. It will make an impression on the police afterwards. One of the problems of this speed measuring is that the police concentrate on the number plate. When the official letter arrives it says that car No, xyyzz was moving with at least 20 kilometres per hour over the speed limit in the main street etc. etc. The problem is that our car is registered in the name of Mr. Swiss and the police are convinced he was driving and the letter is addressed to him. This can lead to a serious discussion and cause a family problem about who was actually driving the car when it was attempting to go through the sound barrier. Of course it was not me, although it could have been. Try keeping your foot off the gas pedal in the car when only 30 kph is allowed. Another problem is that the fines for violating the speed limit are no longer just fifty swiss francs, but usually now have another zero at the end. I do not drive so much today, just my wheelchair. I do not know how fast I travel, but am always wary of any radar apparatus which might be positioned on the way. Speeding in a wheelchair is not a good idea, they might take my licence away. I knew a kid who got a speeding ticket on a bicycle. I don’t think he paid it since they couldn’t take his license. What license?